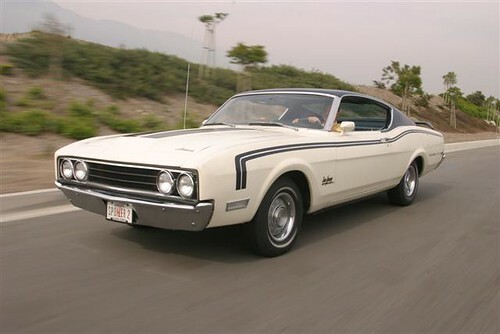 Home/Museums and Collections/Our Collection/1969 Mercury Cyclone Dan Gurney Special Spoiler II; One of One! 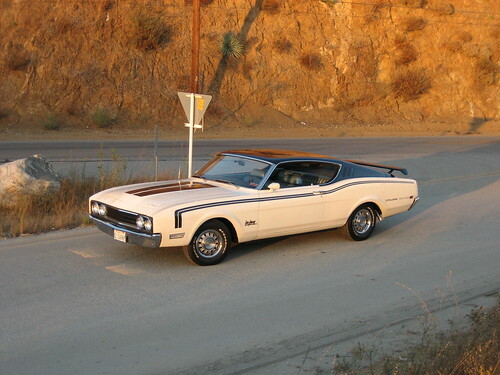 1969 Mercury Cyclone Dan Gurney Special Spoiler II; One of One! This car in our collection is a SURVIVOR, it is an original non-restored limited production factory modified car. Unlike today, in 1969 the NASCAR race cars were actually STOCK CARS. Many times they were built from cars straight off the show room floor. I can remember seeing a lot of race cars in their factor paint colors. It was also the time of the AERO WARS on the Super-speedways. The win on Sunday sell on Monday competition between manufactures resulted in the Dodge and Plymouth winged cars. 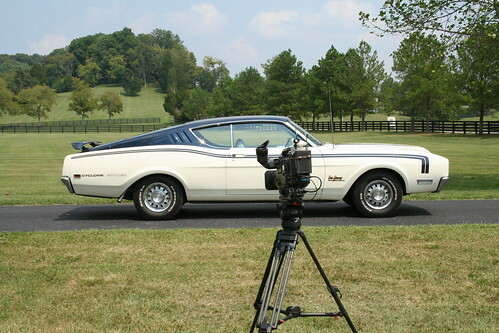 They were built in response to the Ford Torino and later Ford Talladega and this car, the Mercury Cyclone Spoiler II. NASCAR mandated that at least 500 examples of each car destined for the race track be manufactured before they could race. According to the official Cyclone Registry 503 Spoiler IIs were ever built (some experts say this number was greatly inflated and that number was never built). These were divided between two examples; 285 were red and white Cale Yarborough Specials and the remaining 218 were blue and white Dan Gurney Specials. The Registry also states that of the 218 built; only 35 Dan Gurney cars are known to still exist in any condition. All of the Dan Gurney Spoiler IIs were bilt exactly the same way except for one car. One of them was built as a heater delete car. This is that car, it is truly ONE of One. What makes the Spoiler II so special? Each Cyclone Spoiler II had the entire front end cut off just in front of the front tires and 19.5 inches of new sheet metal added. These cars were all hand built. 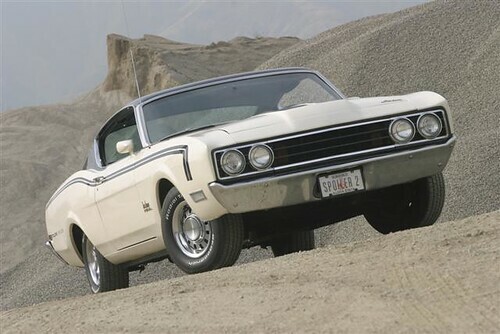 Among other modifications, the new front bumper was made by taking a rear bumper off a Ford Torino, cutting it into 3 pieces, welding it back together and tucking it up as close to the body as possible to increase aerodynamics, it became an early example of a spoiler! Over 50 parts on this car carry an “X” for “experimental” in the part number. Although very similar in appearance and purpose to the Ford Talladega, the Spoiler II shares very little in common with its Ford sister. For more on the details on these differences you can check out our other pages devoted to these cars. –Featured in Motorbooks Muscle Car Calendar 2014. -Featured on Top Ten Muscle Cars 2017 Power Nation NBCSN. The following two images are of this car when it was used as the Spoiler II for the Muscle Cars collector cards! Who is Dan Gurney, Click Here? For the full story on this car click on the image. To Learn More about these cars Click Here. Hi, do have a true (no doubt) Dun Gurney Cyclone II stored since 28 years, it is not a beuty but still a Gurney, engine is long gone but all x-sheet metal, rear wing and dropped “dorrstep” and more is in place. Painted in wrong (I know) and bad rear “wheel-fender”. What could it be worth as is or in a rapir 100% mint conditions. Do have ideas change drivtrain and engine to a sidoiler, N-house and big Rug. Your’s opinion to above. Value as is today, tomorrow? Regards…..
Hans, If you would like to send some photos and more detailed information to Richard@LegendaryCollectorCars.com I will try to give you a range of the cars value. To some extent it even depends on what part of the Country the car is located in. Is the project Spoiler II for sale?